We feel both pleased & honored to introduce ourselves as Gurtour Travel Agency is one of the leading travel company in IstanbulWe, Gurtour are specialized in providing all ground arrangements you may need in Turkey;. Domestic and International Fairs information database, all fairs in Turkey, Most fairs all around world and everyting about China Canton fairs. Assistance services for Turkey and China fairs. 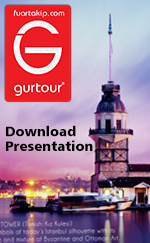 All tour programs serving by GürTour with details. Turkey's all natural beauty and cultural sites tours with expert guides. View details and dont miss perfect tours.